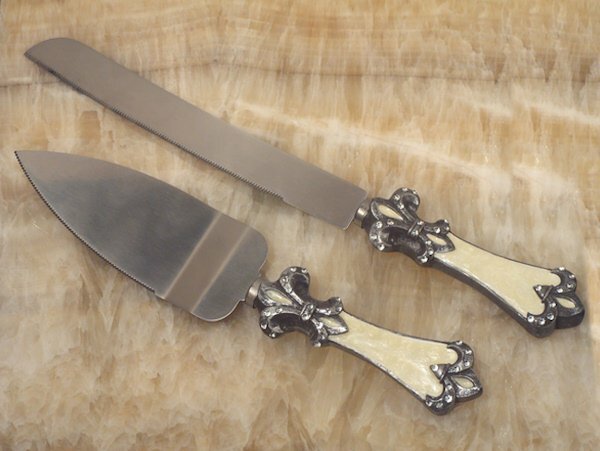 Add a special touch to your cake cutting ceremony with our Sophisticated Ivory Fleur De Lis cake knife and server set. The photos of your special moment will look amazing when you include this dazzling accessory. Each sturdy stainless steel cake knife and server is accented with a sculpted Fleur de lis design accented with crystals. Cake server measures 10" and cake knife measures 12" long. Comes packaged in a display gift box.